School’s out for the summer! And with the end of the school year comes more family leisure time, more time to play outside for the kids and less time it seems to pay attention to the health and safety of those precious little smiles. 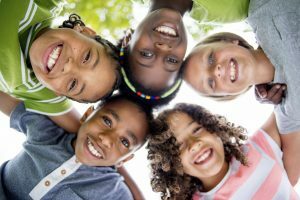 To get the summer off to a good start, Naples family dentist Dr. Makram would like to offer some tips on how parents can best protect their children’s teeth and smiles. If your child is due for a dental checkup, then schedule one now at the beginning of the summer. This way, if they need any treatment such as a tooth-colored filling, there’s plenty of time to schedule an appointment conveniently before their summer activities get into full swing. Cool summer snacks are hard to resist, especially on a hot day in Naples. Ice cream, popsicles, soft drinks, juice boxes, candy bars, cakes and cookies are hard to resist during a day of summer. However, the sugars in these tempting treats are a leading cause of cavities. So the more sugar your children eat, the more likely they are to develop cavities. Try to limit sweet treats. And when you do say, “Yes, you can have that,” serve sugary snacks with a meal. Summer is a great time to add more recreational activities to your children’s schedules. If your children will be participating in sports—baseball, basketball, soccer, swimming, field hockey and more—then be sure they have a mouth guard. Your child’s mouth guard can be custom-fitted for comfort and style. Worn regularly, a mouth guard protects teeth, gums, tongue and lips from injury. Even if you don’t think a sport will involve contact, a mouth guard is protection from an unexpected accident. In addition, there is new evidence to show that wearing a mouth guard may reduce the risk of concussion or reduce the severity of a concussion should one occur. We understand that rules get relaxed over the summer—bedtime might be later than during the school year. But one rule that should be followed regardless of the time of year is the one that requires regular at-home oral hygiene. Make sure your children stick to brushing their teeth at least twice a day and flossing one time a day. These can go a long way toward ensuring that your children’s smiles remain healthy over the course of a fun summer! Start your children’s summer off right with a visit to the Naples family dentistry practice more parents trust. Dr. Makram and his team will be happy to take care of you and your children’s smiles!